Does your horse have a nervous disposition, live in a stressful environment or have issues with gastric ulcers? 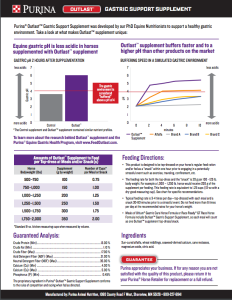 Purina’s team of Ph.D. equine nutritionists and equine experts have researched to find a better way to support your horses’ gastric comfort with the new Purina Outlast Gastric Support Supplement. It is estimated that up to 90% of active horses experience gastric discomfort, affecting health, attitude and performance. 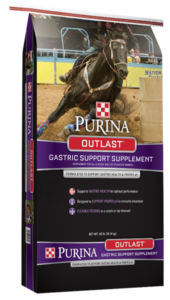 Purina® Outlast™ Gastric Support Supplement is the latest innovation from Purina and is part of an overall gastric health program designed to aid equine gastric comfort and support horses that may develop gastric issues. Outlast™ Supplement contains a unique blend of ingredients to support proper pH, giving you and your horse the confidence to perform. 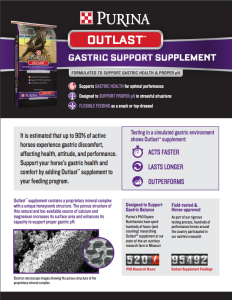 Ready to try Purina® Outlast™ Horse Supplement? Sign up for the Feed Greatness Challenge™ today or stop by our location in Argyle, TX to try the newest Outlast Supplement products. Find out more about these products below. This entry was posted on Wednesday, June 14th, 2017 at 1:09 am	and is filed under News & Updates. You can follow any responses to this entry through the RSS 2.0 feed. You can skip to the end and leave a response. Pinging is currently not allowed.